Honey-bellied green metallic sweat bee, Agapostemon melliventris Cresson, 1874 (Hymenoptera: Halictidae). This species is one of the many (​~4,000 bee species in North America) that do not live in hives, but individually. This species, like many, nests in the ground. Agapostemon melliventris bees are small (1 cm / 0.4”) and can be attracted to sweat for their nutrition, but they only bite or sting if heavily provoked. These bees are key pollinators of various cactus species that provide important food and shelter for desert dwellers, such as tortoises and cactus wrens. Western Hercules Beetle, Dynastes grantii Horn, 1870 (Coleoptera: Scarabaeidae). This species is a type of rhinocerus beetle that is native to AZ and is one of the largest in the US at 50–80 mm / 2–3" long. Males have horns and females do not. Adults feed on tree sap, but are harmless to the tree. Moisture, such as falling rain, causes their grey outer cuticle to turn black. Apache (or Citrus) Cicada, Diceroprocta apache Davis, 1921 (Hemiptera: Cicadidae). 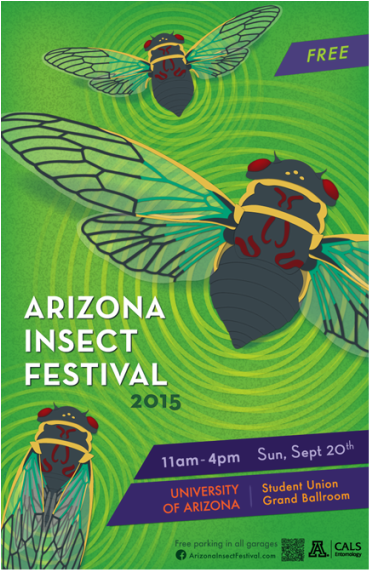 Apache cicadas create quite the buzz during sizzling summer days in Tucson and are one of the only insects that sweat. The Navajo used the cicada as a symbol for access to various worlds. Thornbush Dasher, Micrathyria hagenii Kirby, 1890 (Odonata: Libellulidae). Dragonflies spend the bulk of their lives as underwater predators -- sometimes longer than a decade! They emerge and may be seen as adults for as little as a few days or weeks. Two-tailed Swallowtail Papilio multicaudata W.F. Kirby, 1884 (Lepidoptera: Papilionidae). Adults butterflies are visible in spring and summer. Females lay eggs on host plants and the emerging caterpillars feed on the foliage. Once finished eating they pupate and emerge the following May. The Two-tailed Swallowtail is the Arizona State butterfly. Desert leaf-cutting ant, Acromyrmex versicolor Pergande, 1894 (Hymenoptera: Formicidae). Some of Earth’s earliest farmers, these ants collect plant parts and grow underground fungal gardens. Trails are fun to watch as workers actively bring provisions into their volcano-shaped nests during the coolest parts of the day. Each differently-sized ant, known as castes, has different job within the colony. They do not bite or sting. "...kudos for a spectacular event...it was probably the largest outreach event the UA has ever put on..."
"My congratulations on a very successful festival...the place was packed particularly with youth. 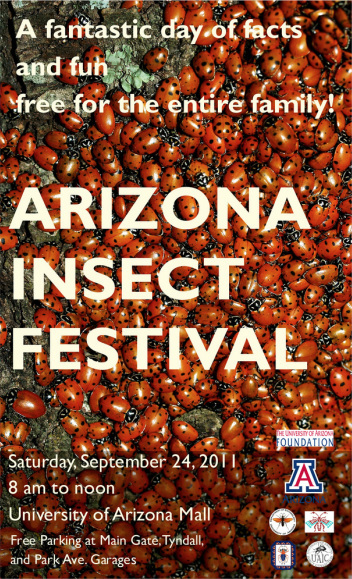 Fabulous..."
"We now have had two wildly successful Insect Festivals. I've seen nothing else to rival the impact of these events on families and especially little kids."